Earlier today Brian spent some time with the G2, LG's 5.2-inch flagship smartphone based on the Qualcomm Snapdragon 800 (MSM8974) SoC. I'd recommend reading his excellent piece in order to get all of the details on the new phone, but there's one disclosure I'd like to call out here: the G2 supports Panel Self Refresh. To drive a 60Hz panel, your display controller must present the display with the contents of the frame buffer 60 times per second. Regardless of what's being displayed (static vs. active content), every second there are 60 updates pushed through the display pipeline to the display. When displaying fast moving content (e.g. video playback, games, scrolling), this update frequency is important and appreciated. When displaying static content however (E.g. staring at the home screen, reading a page of an eBook), the display pipeline and associated DRAM are consuming power sending display updates when it doesn't need to. 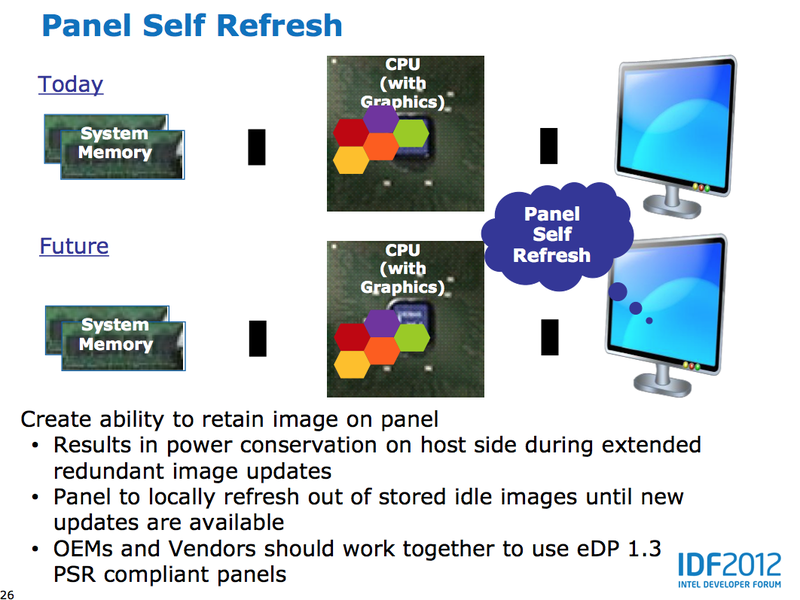 Panel Self Refresh (PSR) is designed to address the latter case. To be clear, PSR is an optimization to reduce SoC power, not to reduce display power. In the event that display content is static, the contents of the frame buffer (carved out of system RAM in the case of a smartphone) are copied to a small amount of memory tied to the display. 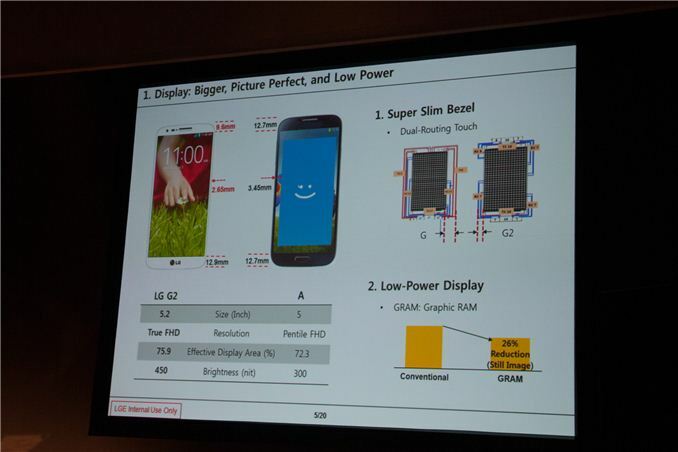 In the case of LG's G2 we're likely looking at something around 8MB (1080p @ 32bpp). The refreshes then come from the panel's memory, allowing the display pipeline (and SoC) to drive down to an even lower power state. Chances are the panel's DRAM is also tied to a narrower bus and can be lower power than the system memory used by the SoC, making these refreshes even lower in power cost. LG claims a 26% reduction in power when displaying a still image with PSR enabled. I'm curious to see the impact on overall battery life. There are elements of our WiFi web browsing test that could benefit from PSR but it's unclear how much of an improvement we'll see. The added cost of introducing additional memory into a device is something that panel vendors have been hesitant to do, but as companies look to continue to reduce platform power it's a vector worth considering. LG's dual-role as a component supplier and device maker likely made the decision to enable PSR a lot easier. PSR potentially has bigger implications for notebook use where it's not uncommon to just stare at a desktop that's not animating at all. I feel like the more common use case in smartphones is to just lock your phone/display when you're not actively using it. "I feel like the more common use case in smartphones is to just lock your phone/display when you're not actively using it." I'm not expecting to see the screen power consumption go down at all. Just maybe see a wee bit more battery life out of my usage model. Nice! Glad to see PSR getting some traction.